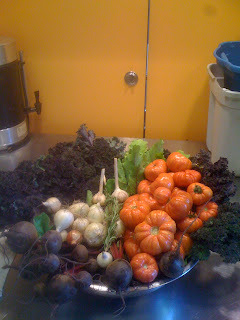 Because a portion of the cost of each CSA share is earmarked for Oppenheimer Community Kitchen harvests, we like to keep y'all updated on what their share looks like. Here's this week's harvest, featuring beautiful Copia tomatoes, Red Ace beets, Chesnok Red garlic, Redbor kale and sweet Sierra Blanca onions. These veggies will help make a beautiful, nutritious soup!